Cachexia is a complex syndrome that combines weight loss, lipolysis, loss of muscle and visceral protein, anorexia, chronic nausea, and weakness. Severe cachexia occurs in most patients with advanced cancer or AIDS. This article covers approaches to cachexia other than treatment of the underlying disease. In those patients who are eligible for tumouricidal treatment, cachexia may resolve as the disease responds. Does the patient have cachexia? Why is the patient cachectic? How should treatment be individualised? More than 80% of patients with cancer or AIDS develop cachexia before death. At the moment of diagnosis, about 80% of patients with upper gastrointestinal cancers and 60% of patients with lung cancer have substantial weight loss. In general, patients with solid tumours (with the exception of breast cancer) have a higher frequency of cachexia. Cachexia is also more common in children and elderly patients and becomes more pronounced as disease progresses. Because of the chronic nature of cancer cachexia, the diagnosis is simple. A patient's clinical history, the presence of substantial weight loss, and physical examination are adequate for an accurate diagnosis. Plasma albumin concentration is usually decreased. Simple bedside measurements—such as triceps or subscapular skin folds (for body fat) and arm muscular circumference (for body lean mass)—may be useful to monitor nutritional changes or the effect of treatments in patients in whom body weight might be unreliable (such as those with ascites or oedema). More sophisticated laboratory investigations are usually unnecessary. Immunological tests are unreliable markers of nutritional status in patients with cancer or AIDS because of the immunological abnormalities due to the underlying illness. While metabolic abnormalities are the main cause of malnutrition, decreased caloric intake and malabsorption also contribute to the cachexia syndrome. 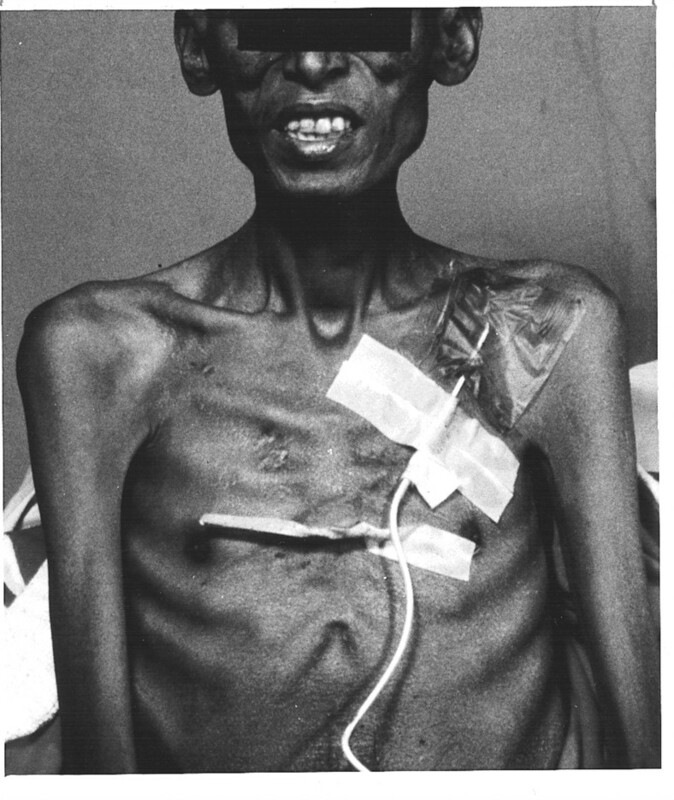 Anorexia is an almost universal component of cachexia. Reduced caloric intake may be more severe in patients with dysphagia due to head and neck pain or oesophageal carcinoma, psychological depression, abnormalities of taste, or chronic nausea. The last is a common symptom in malignant diseases and can be due to autonomic failure, opioids and other drugs, constipation, or bowel obstruction. Traditionally, cancer was assumed to cause cachexia by consuming energy and by releasing factors capable of causing anorexia. This interpretation justified aggressive nutrition as an approach to restore the energy balance. The emerging view is that cachexia of cancer is mainly due to major metabolic abnormalities. These are caused predominantly by cytokines released by the immune system as a response to the presence of the cancer (cachectin-tumour necrosis factor and interleukins 1 and 6) and are probably also related to the cachexia of other diseases such as AIDS, tuberculosis, and leprosy. Tumour products have also been identified (such as lipolytic hormones). These factors cause profound lipolysis, negative nitrogen balance, and anorexia. In most patients, anorexia is more likely the result of the catabolic process rather than the cause of the cachexia. This view explains the failure of aggressive nutrition in changing clinical outcome, symptoms, and the nutritional status of cancer patients. This should be suspected in patients with pancreatic insufficiency due to pancreatic or other gastrointestinal cancers, or in patients who have recently received aggressive radiation therapy to the abdomen. It is an uncommon cause of malnutrition. Weight loss is an independent risk factor for poor survival. Cachectic patients have a higher incidence of complications after surgery, radiotherapy, and chemotherapy. In addition, cachexia aggravates weakness, is associated with anorexia and chronic nausea, and is a source of psychological distress for patients and families because of the associated symptoms and the changes in body image. This prompts some to attempt aggressive nutritional supplementation. The complications of cachexia and the view that it results mostly from an energy deficit has generated many studies attempting to reverse these complications with total parenteral or enteral nutrition. Unfortunately, these studies have generally found no significant improvement in patient survival or tumour shrinkage, and limited effects on the complications associated with surgery, radiotherapy, or chemotherapy. Since most studies failed to assess patients' symptoms it is not clear if intensive nutrition confers any symptomatic benefits. However, intensive nutrition is appropriate in certain clinical situations, such as in patients recovering from surgery and awaiting chemotherapy. When selecting patients for nutrition, doctors must take into account the morbidity (15% in some studies) and the financial cost. Several drugs have beneficial effects on the symptoms of cachexia, and some have effects on patients' nutritional status. These improve both anorexia and weakness in cancer patients. However, these effects are purely subjective and are not accompanied by any important improvement in caloric intake or nutritional status. The effects are usually short lasting (limited to 3–4 weeks), but they are usually well tolerated for brief periods even in very ill patients. The mechanism of action is unknown but is possibly related to inhibition of the release of metabolic products by the tumour or immune system or to a non-specific central euphoriant effect. Corticosteroids also have antiemetic and other effects, including analgesia, improvement in neurological symptoms due to cerebral oedema and spinal cord or nerve compression, decrease in breathlessness due to lymphangitis carcinomatosis, and anecdotal reports of a beneficial effect on the symptoms associated with bowel and ureteral obstruction. Medroxyprogesterone and megestrol acetate may substantially improve appetite, caloric intake, and nutritional status in patients with advanced cancer or AIDS. These drugs also result in an increased deposition of fat. Controlled trials have shown that megestrol acetate improves several symptoms in addition to appetite, including a sensation of wellbeing, reduced fatigue, and some aspects of quality of life. When used as an appetite stimulant, megestrol acetate has no effect on survival of patients with cancer or AIDS. The progestational drugs' mechanism of action is unclear. Since intensive nutrition has limited nutritional effects and no obvious symptomatic advantages, it is unlikely that both the subjective and objective effects of megestrol acetate are due to increased appetite and caloric intake. More likely, these drugs have an effect on the metabolic abnormalities due to the cancer, and the increase in appetite is secondary to reversal of the catabolic state. The main drawback of progestogens is their high cost and side effects such as oedema and thrombotic episodes. These can have a considerable effect on symptoms in patients complaining of anorexia accompanied by early satiety or chronic nausea. Such symptoms are mostly due to gastroparesis because of autonomic failure, brought on by the presence of the cancer or malnutrition, or the effect of drugs such as opioids or tricyclic antidepressants. Other drugs are thought to have effects on appetite, but the evidence is anecdotal and clinical use is not justified at this time. Clinical trials are being conducted on cyproheptadine, oxpentifylline, melatonin, thalidomide, certain cannabinoids, and low doses of alcohol. Hydrazine sulfate has had publicity in north America and is used widely as an “alternative” drug for cancer cachexia. Three recent randomised controlled trials have found it no more effective than placebo with regards to nutritional status, survival, symptoms of cachexia, or quality of life. In addition, it causes considerable toxicity, including peripheral neuropathy. It is extremely important to establish initially what patients, their family, and their physician expect from any treatment. Neither nutritional nor drug treatments confer any survival advantage in metastatic cancer. Intensive nutritional replacement has limited, if any, value for patients with advanced and progressive disease; exceptions may include head and neck tumours that advance locally but metastasise slowly and neurological disorders such as motor neurone disease. Although megestrol acetate and, in some cases, artificial nutrition provide nutritional improvement, this alone does not justify treatments that are potentially toxic for terminally ill patients unless there is a substantial benefit to quality of life. 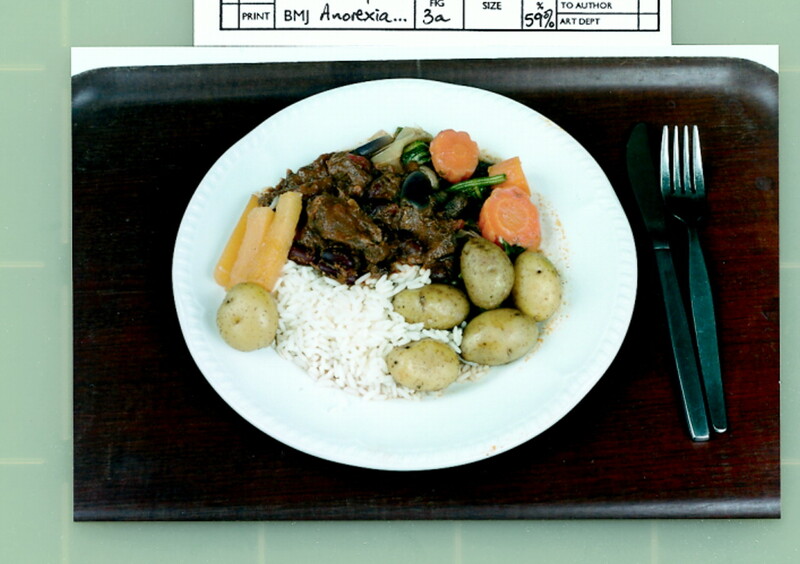 Patients who are unable to swallow because of severe dysphagia (for example, because of head and neck or oesophageal cancers and neurological disorders) and who complain of hunger or express concerns related to malnutrition may benefit from nutrition via a gastrostomy tube. 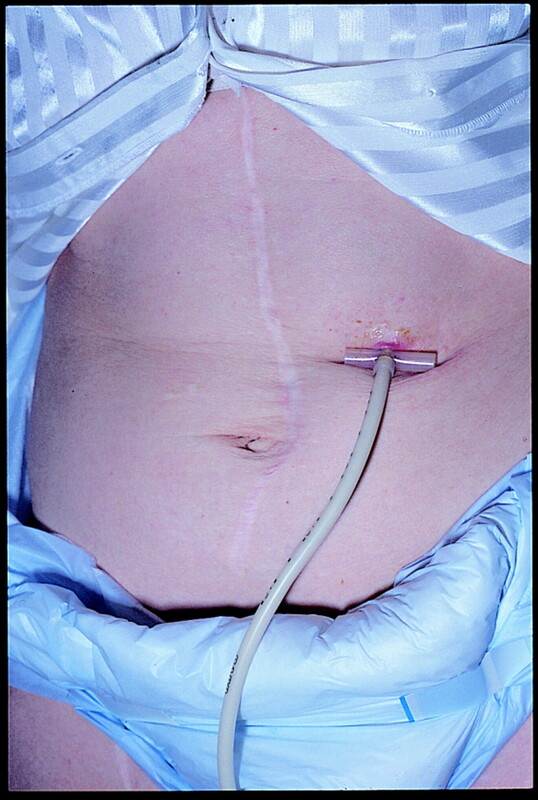 Such tubes can be inserted with ultrasonographic or endoscopic guidance. Patients with chronic nausea, early satiety, or other findings suggesting gastroparesis should receive a trial of a prokinetic drug. Patients with slowly progressive illness for whom anorexia is an important symptom may benefit from both the symptomatic and nutritional effects of megestrol acetate. Severely ill patients with multiple complex symptoms and a limited life expectancy are more likely to benefit from the multiple symptomatic effects of a course of corticosteroids. Finally, patients for whom anorexia is a relatively minor problem or those who are severely cognitively impaired may not require any treatment. In patients with mechanical bowel obstruction, prokinetic drugs may aggravate emesis. Antiemetics, octreotide, hyoscine, or nasogastric drainage will be required for symptom relief. Some special conditions may further reduce food intake and require assessment and management; these include chemotherapy or radiotherapy induced mucositis or emesis and severe depression. Clinical trials are currently being conducted on drugs with a subjective effect on appetite and energy, anabolic agents, and drugs capable of inhibiting the release of cachectin-tumour necrosis factor. Differential nutrition with amino acids and fatty acids capable of influencing the metabolic response of the tumour are also being investigated. Eduardo Bruera is professor of oncology at the University of Alberta and director of palliative care at Grey Nuns Hospital, Edmonton, Alberta, Canada. The ABC of palliative care is edited by Marie Fallon, Marie Curie senior lecturer in palliative medicine, Beatson Oncology Centre, Western Infirmary, Glasgow, and Bill O'Neill, science and research adviser, British Medical Association, BMA House, London. It will be published as a book in June 1998.